Can you help me identify this plant? I took a tiny cutting from my friend's plant, she calls it a money tree, but she's not sure. 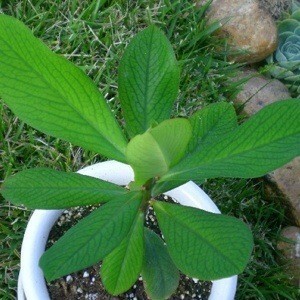 It's so easy to grow, I just put a bit of hormone and stuck it in potting soil; it had a milky sap. 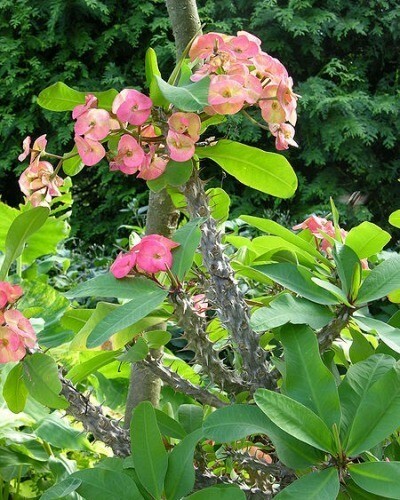 Looks like it might be Euphorbia, or Crown of Thorns. We have some by our mailbox, here in central FL. They don't need any care, except sun. And they flower year round. It does look like your euphorbia plant, but at this point, my cutting has a smooth stem; the thorny stem may come later, I suppose, and the flowers too. I don't think it is euphorbia as this cutting is now about 2.5 ft. tall and has no thorns on the stem. It did have a spike of maroon-colored buds. All its leaves falls out in winter but comes back in full glory from spring to summer and fall, but thanks anyway for the feedback.